"It will be coming from a biblical perspective. God said it, and 'Bang' there it was," said Burr with a laugh. "The Big Bang theory has real problems. The only reason it still survives is because they've got nothing better. I'll be sharing a ton of quotations from physicists who will tell you that." Burr has an impressive collection of slides — more than 400 from the Hubble telescope alone — that can provide his audience with just a hint of the vastness of the universe. "I remind the audience that if you're standing on this side of the galaxy and you're calling mom on the other side of the galaxy, it'll be 100,000 years before her phone even rings. Then, if she says 'Hello,' it'll be 200,000 years before you ever hear her answer," explained Burr. "Teens would love that — 'I called home and nobody answered.' I've got to throw a little humour in, make it a fun thing, so people can get their brain around what's going on here." Astronomy first piqued Burr's interest at a young age. "I got interested as a little kid, sitting at a camp meeting, when a man lectured on the heavens," he recalled. "The seed was planted, but it lay dormant for 20 years or so. ... Then I took a class, an adult education class, and built a telescope. As I was taking this class, I got really excited about it. I was a youth leader at church, and I started taking magazines down to the youth group and sharing it with them. Pretty soon, I was buying slides, then started showing the slides. ... I guess I got excited and had to share what I was learning with the other people, had to tell somebody else about it." Burr's enthusiasm for astronomy and the biblical perspective he finds in the heavens has rubbed off on others. He has more than 500 letters on file thanking him for his insightful presentations. One student wrote: "I wanted to thank you from the depths of my heart for giving the stronomy classes. They inspire me in how big and wonderful our Creator is, how He loves us so much. Looking at the many extraordinary slides you showed, I realized for the first time how vast space is. For space to be so magnificent, just think how much more magnificent our Father is. Now, every time I look at the night sky and see the stars so very far away, sparkling like diamonds, or when I see the brightness of the full moon, I praise the Lord for his overwhelming greatness." Each summer, Burr lectures to science students for the Frontiers in Science Foundation at Greeley, Colo., sharing his own love of astronomy, and was recently pleased to find out he'd influenced this year's winner of the National Young Astronomers' award. "He came up to me after the lecture and told me that six years ago he'd sat in on one of my lectures, and that's what sparked his interest," recounted Burr. "That's exciting." Burr's programs are free, but a free-will offering will be taken. For more information, contact the Seventh-day Adventist Church, (507) 831-5566. WINDOM — There's a vast universe of beauty, undoubtedly created by God's hand, that can be seen through a telescope, and Jim Burr wants to share it. 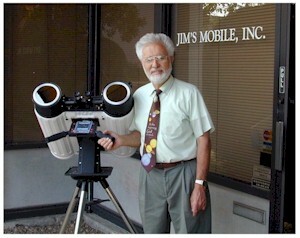 Burr, an astronomer and founder of Jim's Mobile, Inc. (JMI), a manufacturer of astronomical telescopes, will bring his "Astronomy and the Bible" presentations to Windom this weekend. Shows, with different content, will be at 7 p.m. Friday and 11 a.m., 2 and 7 p.m. Saturday at the Seventh-day Adventist Church, U.S. 71 North, Windom. Burr is a native of Minnesota, who now lives in Colorado. He speaks about astronomy from a biblical perspective about 100 times a year and is bringing his program to Windom at the behest of Don Hensel of Heron Lake, who is a member of the Wondom congregation. The two men became friends while attending Union College in Lincoln, Neb. "We sold books together in South Dakota for a couple of summers, and I think we were even roommates for a while," said Hensel, who has seen Burr's presentation on television, but not in person. "We've wanted to do this for a year." During a phone interview from Colorado, Burr explained that each of his programs will offer new views of the universe, many taken with the Hubble telescope. "On Friday night, we'll be doing 'The Hubble, the Bible, the Big Bang,' so we'll be showing the latest Hubble pictures," he said. "You'll see these pretty pictures — what does it mean, how big is it — and have a new appreciation for the universe. We're going to show the best pictures we can get from Earth telescopes and how the Hubble compares, and then we're going to show the best pictures we can from the amateur telescopes and telescopes we manufacture." The Big Bang theory of the universe's creation will also be discussed.